The City of Chicago will debuting the installation on September 29th, 2018 with digital art by Diana Thater, Zheng Chongbin, Jason Salavon, and Jan Tichy. Each artist’s work features digital work such as short films and the artists featured include local School of the Art Institute and University of Chicago faculty, Tichy and Salavon. The first program will run for approximately two hours a day from Wednesday to Sunday throughout year, except during January and February, though the format remains flexible. This allows the installation to adapt, changing content or style depending on the artist or the City’s needs. Art on theMART executive director and art historian, Cynthia Noble, will curate future work to be displayed including contributions from local Chicago artists alongside representatives from the Merchandise Mart’s owner, Vornado Realty Trust, as well as the City and the local arts community. The installation is part of a growing trend in cities across the US, though it will be one of the first permanent digital displays, joining others such as ConvergenceLA - located on the Metropolis LA building - in Los Angeles. ConvergenceLA utilizes a 20’x97’ screen to project a changing, real-time piece created in a collaboration between Refik Anadol studio and Narduli Studio. The installation is interactive and fuses the built environment, art, and technology. The screen is included in the facade of Metropolis LA and is active 12 hours a day, presenting a constantly changing narrative composed of “real-time demographic, astronomical, oceanographic, tectonic, and climate data streams” as well as “social media posts, traffic, and news feeds” gathered from data local to Los Angeles, according to the artists. The piece’s narrative is constantly changing and interactive, allowing the public to access additional content using a QR code or through a dedicated website that curates selections from the material broadcast. Unlike ConvergenceLA, however, Art on theMART will use the entirety of the 2 ½ acre front of the Merchandise Mart as a canvas. 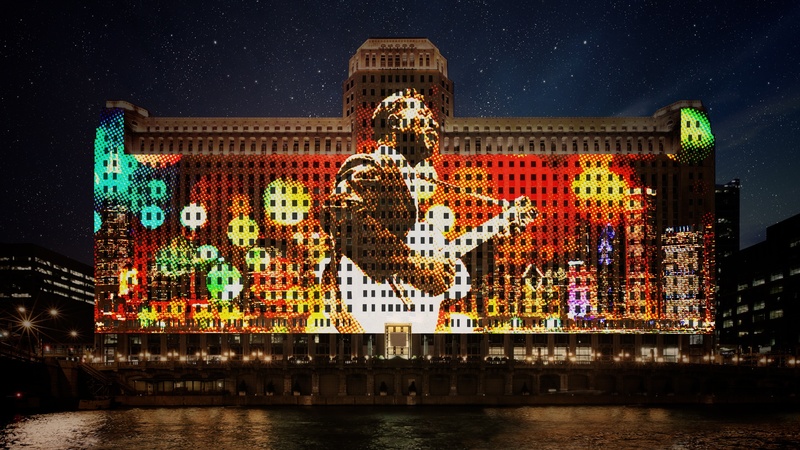 Helmed by San Francisco-based Obscura Digital, the firm is partnering with Chicago firm Valerio Dewalt Train Associates to bring the projection to the Chicago riverfront. Obscura Digital is responsible for similar projects including temporary projections at the Empire State Building, Guggenheim Museum, the Sydney Opera House, and the Vatican. Usually, permanent installations are built using LED screens such as the one utilized by ConvergenceLA. The Merchandise Mart will be uniquely illuminated using “34 projectors mounted above the Riverwalk just east of the tower of the Franklin and Wacker bridge,” according to the Chicago Tribune. The installation will be visible from the Riverwalk as well as from Wacker Drive and is part of an ongoing revitalization of the Chicago River. A cornerstone of the Riverwalk illumination project, the installation will complement the existing riverwalk’s “rooms” and public spaces - designed to create a second waterfront for residents and a gathering place along a new linear park - and the surrounding buildings’ own illumination efforts. The Burnham Chicago team is proud to be a part of the project team bringing the groundbreaking installation to Chicago. Since the project is adjacent to the Chicago River, and requires construction of an enclosed platform to house the projectors, multiple agencies must approve the project including the Chicago Department of Buildings and the Chicago Department of Transportation. Submittals for harbor and bridge permitting are necessary, and the project must also be approved by the Chicago City Council, in what will be a 30-year agreement to light up the front of the Art Deco building. Opening night will feature a live DJ, a lantern procession, and a pyrotechnic show on the Riverwalk. Projector testing has been ongoing for the last two weeks, with over 34 projects now permanently installed across the Chicago River. Obscura Digital will also intersperse the curated works with their own imagery and contributions throughout the life of the project. The Merchandise Mart illumination may help spur similar projects across the city, including those like the Wabash Lights, an interactive illumination of the CTA’s infrastructure that debuted as a trial in 2016. We look forward to seeing iconic Chicago architecture bring visitors and residents closer to Chicago artists in a fusion of built environment and technology. This post was last updated Tuesday, September 4th, 2018.